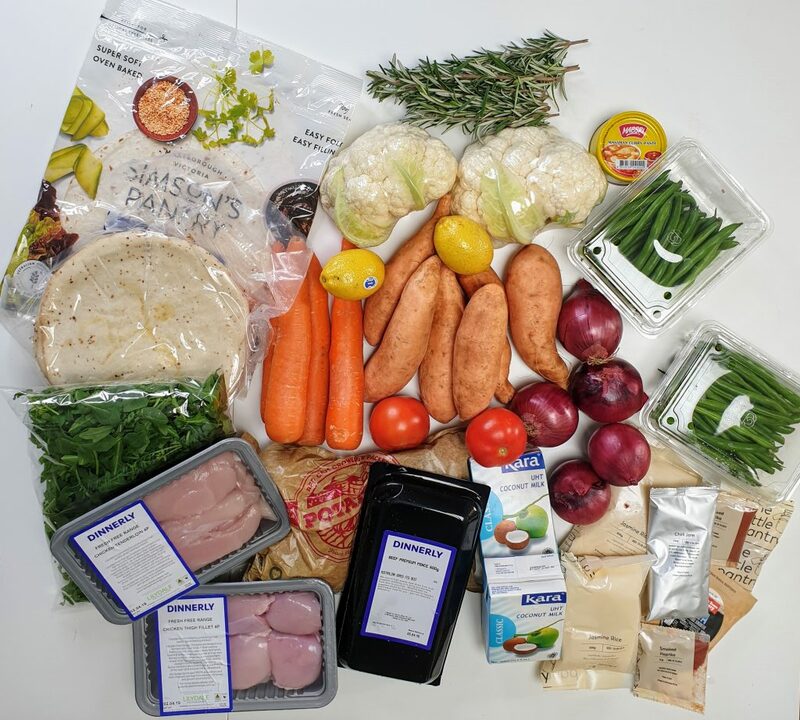 Dinnerly is the latest meal delivery option with the ingredients for multiple meals delivered in a box for you to cook. Last week I was sent the box of 5 meals for 4 adults to compare and review. Dinnerly is the cheapest but that doesn’t mean it is lower value. In fact, I found it to be quite good and definitely more affordable than other options out there. You can $15 off your first and second box here. In a nutshell, for me it is the most affordable, quality is great and way less packaging than the others which matters a lot! No recipe cards, other papers, hardly any plastic and bits and pieces. I was ecstatic with that! Disclosure. This site contains affiliate links for products and services I use. I do not endorse anything I do not use. Read the full disclosure here. Having tried a few of the options now (check a comparison I did here), Dinnerly is affordable, had a simple selection of meals which were easy to make and my kids ate. My daughters and I like to cook meals together so having the ingredients sent like this makes it easy. With the other options, I looked at freshness/quality, price, variety and packaging. Here are my thoughts on Dinnerly in these categories and more. Dinnerly is the cheapest at only $99 for the box with 5 meals for 4 people, it is significantly cheaper than other options. Of course, there are cheaper options starting under $50 as well or less if you use the $15 off coupon. Dinnerly is essentially half the price for virtually the same thing but easier! Everything I received in my Dinnerly box was fresh and good quality. Lately, the quality has slipped drastically with another meal delivery so it was good to see fresh, well-packed produce. Also, it lasted all week. I got busy and couldn’t cook at the start of the week plus my kids has school camp. When it arrived I unpacked then put it all in the fridge. A few days later I cooked some and now, a week later, the few items I have left are still in perfect condition! With the other meal delivery options, the produce is usually off within a week (sometimes within days lately). You’d think with such a cheap service the variety would be limited. It’s not! A selection of meat and vegetarian dishes with different vegetables, curries, Italian and Asian cuisines all get featured and you choose what you want. You can see each week the meals on offer and select the most suitable ones for you. I chose Smoky Beef Tacos (my kids favourite), Thai Chicken Stir Fry, Mild Sweet Potato Massaman Curry, Potato and Rosemary Pizzas and Roasted Lemon Paprika Chicken. All simple, filling and delicious. Aside from the quality and price, it was the lack of packaging I was really happy about. I hate all the little plastic packets and containers I seem to get with other meal delivery options. Dinnerly has minimal packaging although all the produce was packed well and secure. Rather than recipes cards (which I throw in recycling anyway) Dinnerly has the recipes online only. No extra paper, wasted rubbish, packaging or anything else. It is much more environmentally friendly than other options. Usually, I have something to list that I don’t like but Dinnerly were great the whole way through. Customer service was lovely and easy. The price is the cheapest. The $15 discount offer for 2 boxes means you save $30 total (get it here). Less packaging, simple recipes, a great way to teach your kids to cook, overall, I have nothing bad to say! What do you think of meal delivery options? (Below is the picture of everything that came in my box for the meals).